The mission of Garland Church is to build a community of people fully devoted to Jesus Christ, and dedicated to reaching those far from God. Garland Church is a community made up of ordinary people whose lives are being continually transformed by the love, power and grace of the Lord Jesus Christ. We believe that the church is meant to be a spiritual family – one that builds up and encourages on another to become more and more like Christ. It is for this reason that we dedicate so much of ourselves to cultivating discipling relationships within our larger community. Spend some time getting to know Garland! And when you're ready, join us. We would love to know you. We believe that disciplemaking is a mandate for every single follower of christ, and for good reason! Will you join us on the journey? Discipleship is a word that gets thrown around a lot at church. Often, people think that making disciples is something meant just for "super Christians." Disciplemaking is a relational process by which people are encouraged to go further and deeper into the love of Christ, then turn around and disciple others. In other words, disciplemaking means pouring into others – training them in the Word, guiding them in relationship and encouraging them in ministry – so that they may develop into healthy, grounded believers who then share and multiply their faith. At Garland, we do this by encouraging one-on-one or one-on-few relationships within the community. Our disciplemaking groups of mentors and "students" meet together regularly after worship, during Wednesday night fellowship, and outside the church as well – in coffee shops, restaurants, or on hikes. If you have felt alone in your faith, Garland is a place you can really connect. Our disciplemaking groups are growing and evolving. If you are ready to be discipled, let us help connect you with someone who may be a good fit! Interested in discipling others? Seek out Lead Pastor, Rod Cosgrove, or Spiritual Formation Director, Terry Andres, to learn more. 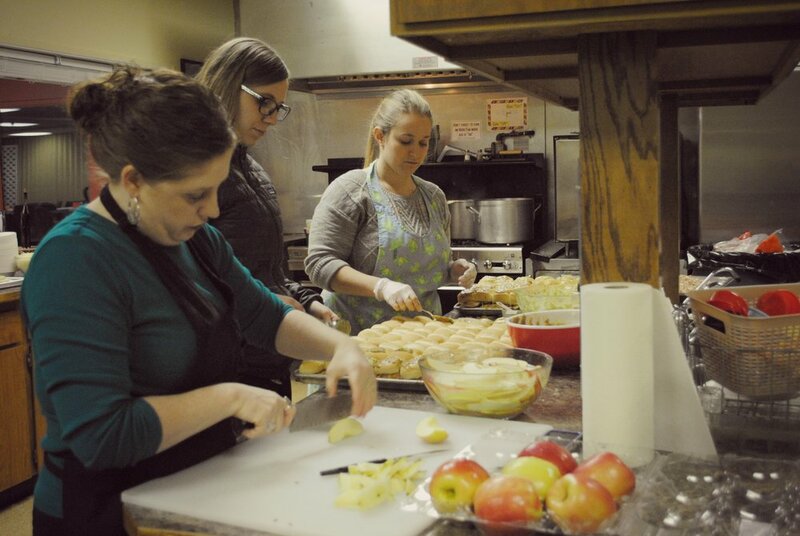 Each Wednesday evening, we gather for fellowship and a lovely, home-cooked meal at 5:30pm. This is a great opportunity to meet people from the community in a casual environment, enjoy dinner, and learn and grow together.